This is a 20W small wattage, green adapter (Level VI, GST25A05-P1J) that comply with up to date energy efficiency regulations (EISA 2007/DoE Level VI). The no load power consumption and the working efficiency of this adapter exceed the performance of Level V series adapters. 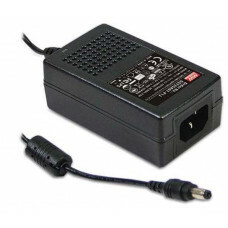 This power supply is ideal for use in various types of consumer electronic devices, telecommunication devices, office and commercial facilities, industrial equipment, and a variety of systems that must meet the latest energy regulations.